Pompeo Makes Surprise Stop In Iraq During Mideast Trip To Rally Allies The secretary's trip has two goals: to reassure allies amid the Trump administration's mixed messages on troop levels in Syria and to stress the U.S. commitment to fighting ISIS and countering Iran. Secretary of State Mike Pompeo waits for his helicopter ride to the U.S. Embassy from Baghdad International Airport, during a surprise visit to the Iraqi capital. Secretary of State Mike Pompeo made a surprise visit to the cities of Baghdad and Irbil on Wednesday, adding the stops in Iraq to his eight-day trip to the Middle East. In meetings that were widely covered by Iraqi TV and other media, Pompeo met with Iraqi Prime Minister Adel Abdul-Mahdi and President Barham Salih, along with Iraq's foreign minister and parliamentary speaker, in Iraq's capital city. "Great to meet the new Iraqi government," Pompeo said in a tweet. "Look forward to working together on key regional issues and to supporting Iraq's energy independence." Afterward, Pompeo traveled to Irbil to meet with officials of the Iraqi Kurdistan Regional Government. The secretary's trip to the region has two goals: to reassure allies amid the Trump administration's mixed messages on troop levels in Syria and to stress the U.S. commitment to fighting ISIS and countering Iran. Pompeo started his Mideast swing in Amman, Jordan, where he insisted that the U.S. decision to pull troops out of Syria would not diminish its ability to fight ISIS. In Iraq, Pompeo and Abdul-Mahdi discussed plans to support Iraq's stability and security as well as its future economic prospects, according to State Department deputy spokesperson Robert Palladino. "The Secretary also discussed the recent territorial defeat of ISIS in Syria and the continuation of our cooperation with Iraqi Security Forces to ensure ISIS' lasting defeat throughout the region," Palladino said in a statement. 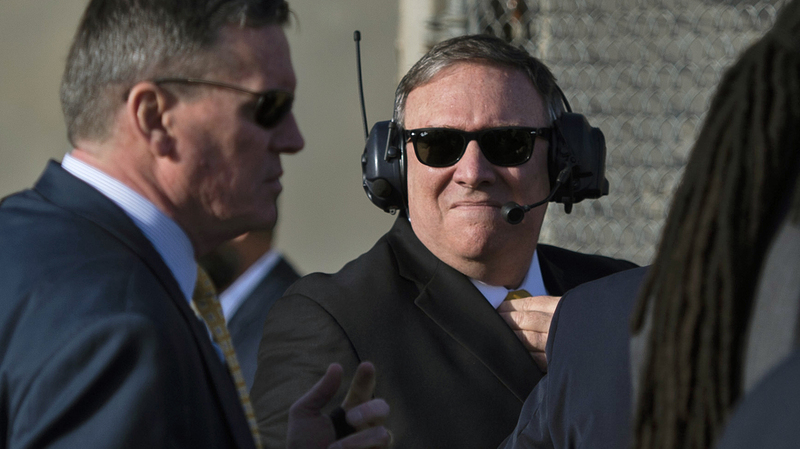 Much as when President Trump visited Iraq in December, U.S. officials kept details of Pompeo's trip secret out of security concerns. The State Department did not include Baghdad or Irbil when it released a list of cities on his itinerary. But White House press secretary Sarah Sanders had said last month that Pompeo planned to visit Baghdad on Jan. 11. Pompeo arrived in the Iraqi capital in fairly low-key fashion, with U.S. Ambassador to Iraq Douglas Silliman and Air Force Lt. Gen. Paul LaCamera of Combined Joint Task Force – Operation Inherent Resolve standing on the tarmac to greet Pompeo and his wife, Susan, as they got off their Air Force C-130. A small pool of four journalists accompanied the secretary's group. "This is the first high-level meeting since President Trump flew in to see U.S. troops at an Iraqi airbase here at Christmas," NPR's Jane Arraf reports from Baghdad. "That visit was controversial here because Trump didn't visit Iraqi leaders while he was in the country." Trump's trip angered some Iraqis, particularly after a planned visit with Abdul-Mahdi was scuttled. At least one Iraqi politician called the president's visit a violation of Iraq's sovereignty, and the act of an occupier, not an ally. Pompeo's time in Iraq seems to have gone smoothly, as he sat down with each of its four main leaders to discuss military and economic relations with the U.S. and plans for the future. The secretary did not take any questions from the press during his trip, and he did not appear alongside any of the Iraqi politicians for a formal news conference. NPR Diplomatic Correspondent Michele Kelemen contributed to this report.